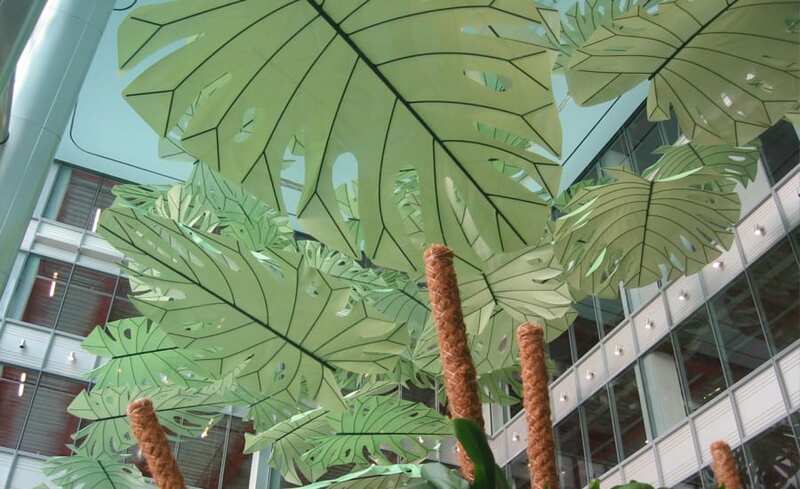 The core headquarters of a major international bank in Londons Canary Wharf was transformed by five spectacular large-scale fabric sculptures created from advanced lightweight materials. These striking examples of interior design at its highest form created the centre-piece of the 34-story block. 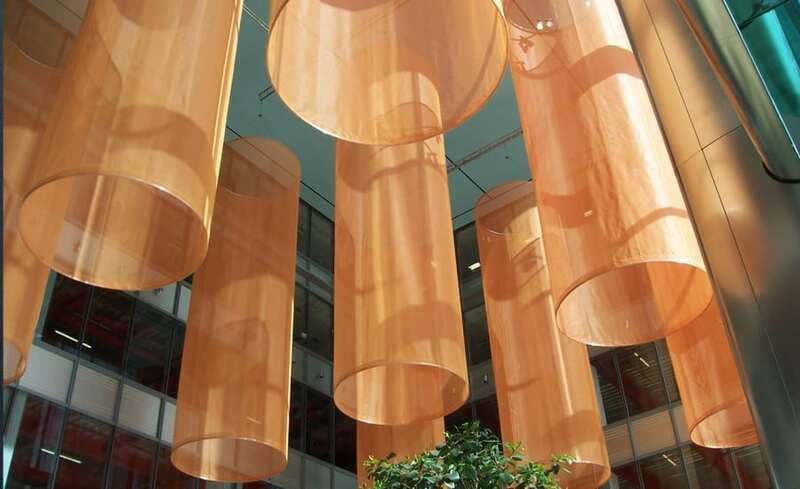 The unusual fabric sculptures at the Bank’s Headquarters in Canary Wharf, would have provided a great challenge for any fabric installer, but with our experience and innovative approach, Architen Landrell was the obvious choice. The project demanded the use of the latest ultra-lightweight materials and working within rigorous weight restraints to ensure the tensioned sculptures could be rigged to conventional interior fittings. The unique design of each element is what makes this project particularly special. 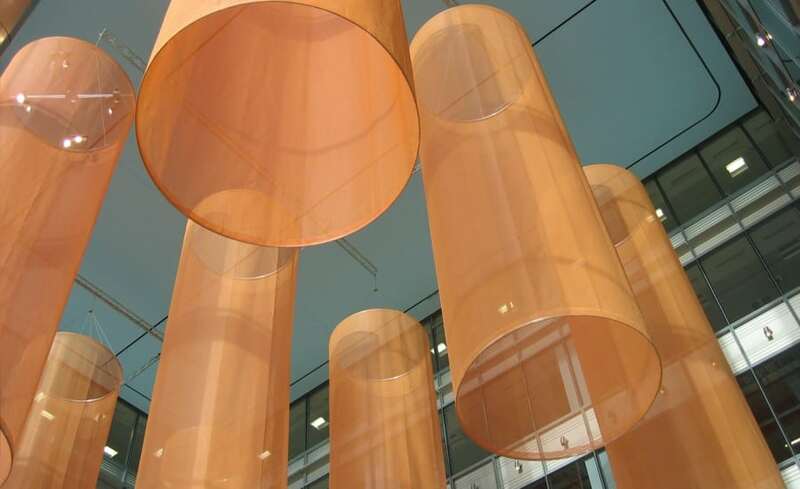 The strongly contrasting sculptures were designed to enrich each of the five vertically-aligned atria forming the heart of the building and provide solar shading and glare reduction while offering inspiring shapes and forms that visually enhance the glazed six-floor interior spaces. 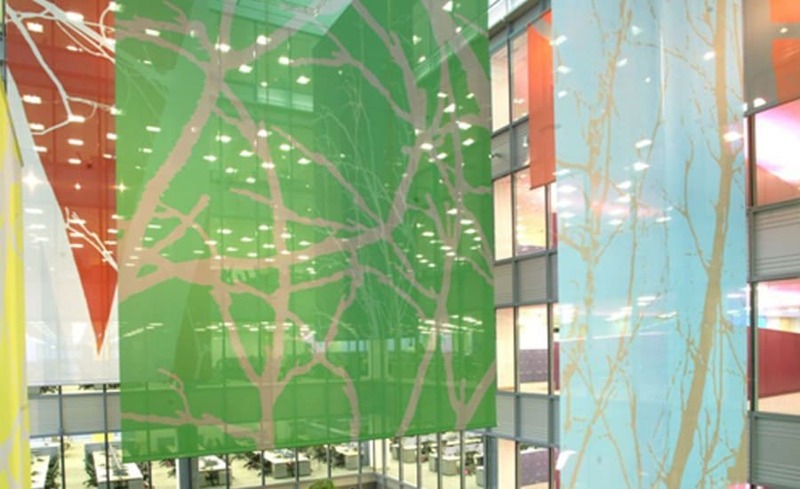 The design process undertaken by Architen Landrell was to develop existing visualisation and art work provided by the client but to incorporate the requirement that the schemes could be lowered and dismantled on a five-yearly basis. 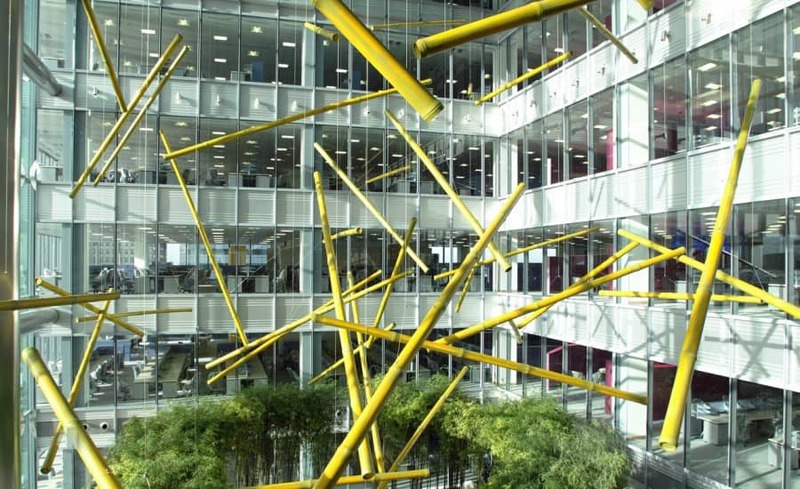 The first level comprises 56 bamboo poles suspended from a 42 stainless steel drop wires, in turn suspended from a lightweight polished aluminium truss, connected to the ceiling. These were all carefully placed, each angle specified by the client. 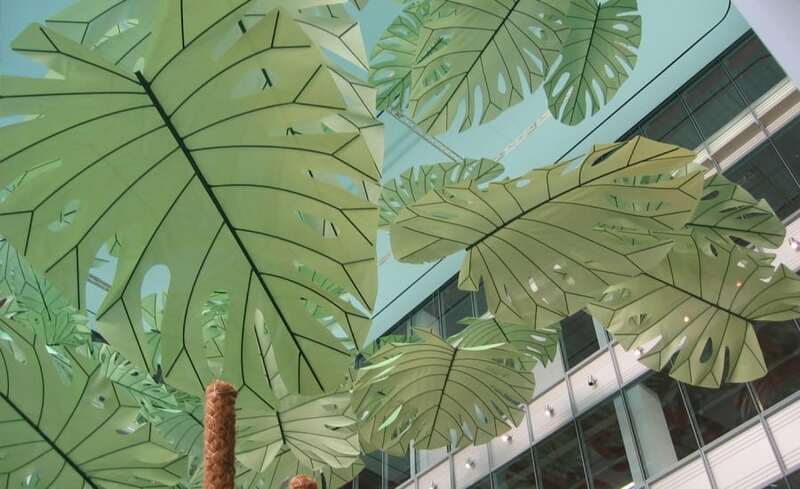 Six floors above hang 80 fabric leaves, providing a rainforest canopy effect over a seating area. 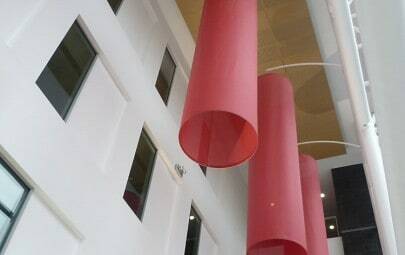 The next atrium houses a cylinder scheme ceiling. Lighting was also incorporated in the front three rings to add maximum effect. 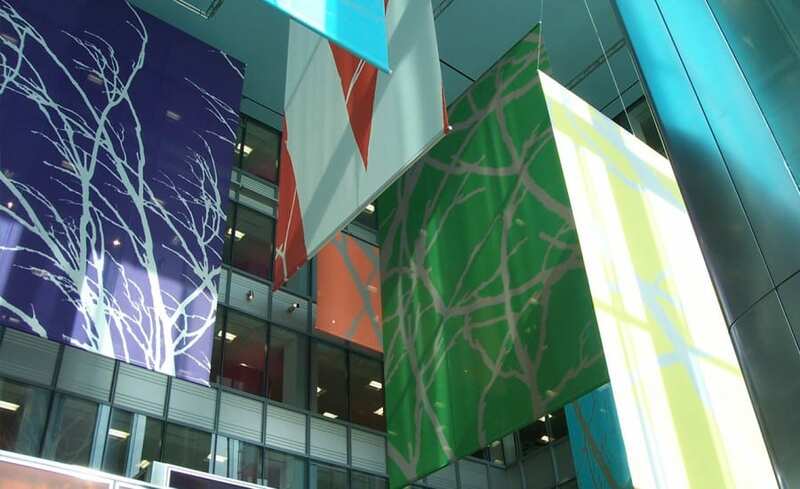 The fourth atrium is filled with hanging banners of various sizes, printed with tree designs, in a multitude of colours. 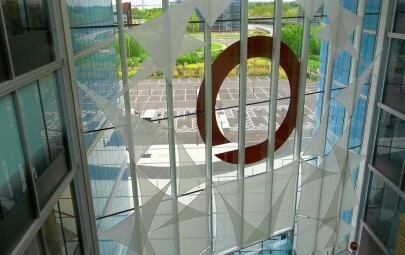 The final atrium was different in a number of ways from the other four. 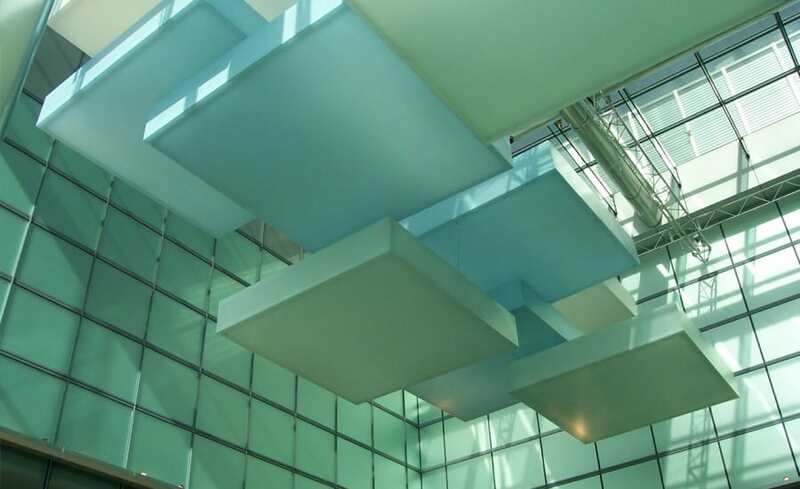 It was situated at the top of the building, and housed nineteen cloud boxes suspended at different levels across the ceiling. 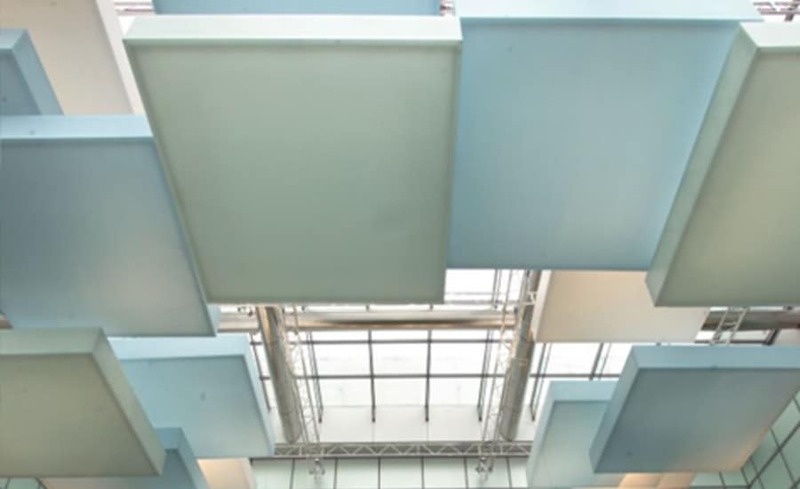 Architen Landrells brief was to turn the interior dream of the scheme consultants into reality, and as one of the biggest interior projects undertaken by the company, it proved an interesting challenge. 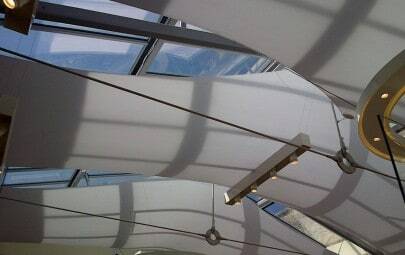 This challenge, however, was undertaken with enthusiasm and success achieving the glare reduction requirements of the atria and also providing the high degree of variety and interest that the client sought. Quite simply it forms a brilliant interior.